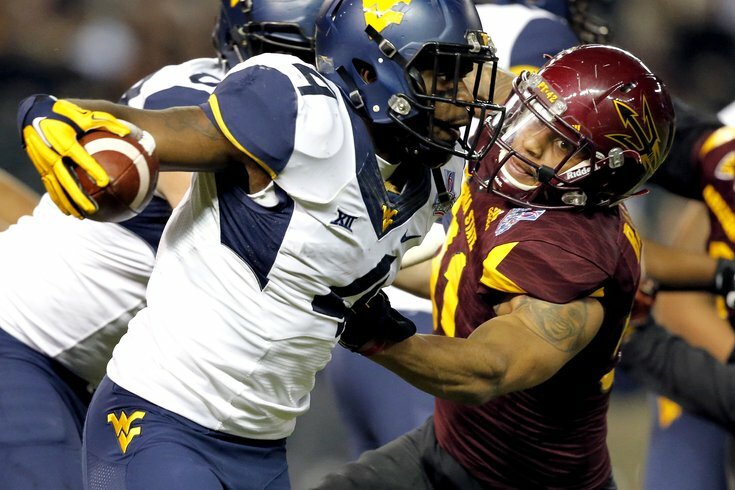 In the fifth round of the 2016 NFL Draft, the Eagles selected West Virginia running back Wendell Smallwood, who could compete for playing time in his rookie season, as the Eagles are not very deep at running back. Most of the coverage around Smallwood has centered around off-the-field issues, however, today we'll take a deeper look at what he is as, you know, a football player. I watched four of his games -- Oklahoma State '15, Texas Tech '15, Baylor '15, and Texas '14. Let's get right to his strengths and weaknesses. You could probably separate vision and cutting ability into two different categories, but Smallwood does a great job combining the two. He does a nice job seeing where holes are developing, and has the ability to cut in the direction of the hole without losing much in the way of speed. This is a great attribute to have as a runner, and it was a big reason for his success at West Virginia. It is, in my opinion, his biggest appeal. Here it appears that the play design is to the left behind the fullback against Texas Tech, but Smallwood sees a hole on the back side and cuts it back with two short choppy steps for a big gain. Note his acceleration once he makes his cut. And then here against Baylor, the play design appears to be to the right side, the linebackers come up, and Smallwood cuts it up behind his left tackle. He puts his foot in the dirt, and bang... acceleration into the open field. In the games I watched, West Virginia didn't ask much of Smallwood as a receiver. They'd call an occasional screen, but Smallwood was little more than a safety valve in the flat. Still, when the ball was thrown his way, he'd pluck it with his hands instead of letting it get into his body, giving him the best opportunity to get yards after the catch. Smallwood ran a 4.47 at the Combine. Of 25 running backs competing in Indy, only five ran better times. Smallwood actually had the same timed speed as Ezekiel Elliott, although clearly, Elliott's overall game is on another level. At his Pro Day, Smallwood ran a 4.41 and a 4.42. His final season, Smallwood had 58 runs of 10+ yards. That's not possible without very good speed, which shows up on film. Far too often when Smallwood hits a wall, he falls backward or sideways. He does not break tackles the same way many of the running backs in the 2016 draft class do. For example, here's a goal line situation against Texas. He has a full head of steam and gets low like you would prefer, but cannot power his way into the end zone. Initial contact in made above well inside the one yard line, but he's stopped cold. In my view, he is a player who will have to come out in short yardage situations. In the games I watched, West Virginia didn't ask Smallwood to pass protect the same way running backs will have to at the NFL level. On most pass plays, they sent him out into the flat as a safety valve, so he didn't often have the responsibility of taking on blitzing linebackers in the hole. However, on those plays in which he would leak out to the perimeter, he would often be asked to "chip" on the opposing defensive end. His effort on those occasions was horrendous. What is this? Hit him! And then here, on a zone read play, Smallwood gives the defender a little "Hey bro, good to see you," before that player runs down the QB for the tackle. Come on, Wendell. Eagles running back coach Duce Staley is not going to stand for that crap. Duce has a lot of work ahead of him getting Smallwood motivated to want to be physical as a blocker. As a runner, Smallwood has talent. He has good speed, a north-south mentality, good vision, and good cutting ability. All of that sounds good, right? Unquestionably, the Eagles have something to work with here. However, due to his inability to push piles and lack of effort as a blocker in the passing game, I would have serious concerns putting him on the field in short yardage situations or on obvious passing downs. He'll probably never be a short-yardage guy, but he can eventually stay on the field if the Eagles can coax more effort and teach him better technique in pass protection. Currently, I see Smallwood as a home run threat who can occasionally spell a more complete back, but he has a long way to go before earning the trust of the offensive coaching staff as a regular steady contributor.